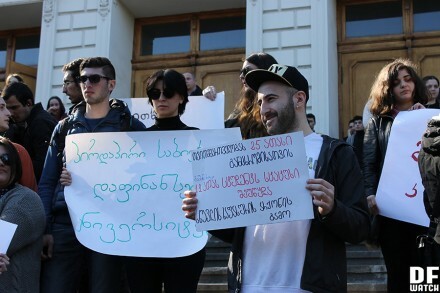 TBILISI, DFWatch–Activists demand transparent funding mechanisms for student government’s projects over allegations of misspending. 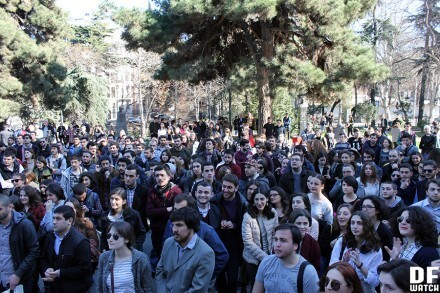 On Monday, 7 March, approximately 300 activists gathered in front of the administrative building of the Tbilisi State University (TSU), one of the largest in Georgia, on Chavchavadze Street in order to protest against the university’s spending policies. The protest was organised by the umbrella organisation of various NGOs and social movements named Students Against the Education Policy (SAEP). According to the protesters, members of the university’s student government (tvitmmartveloba) have enjoyed a privilege of exclusive access to the university’s financial support. The protesters argue that money which should be used for all students’ benefit, has been used to sponsor expensive trips for a privileged group in circumstances where some students are unable to pay their tuition fees and are forced to quit studying. ‘We’re protesting against the student government’s perennial privilege and monopoly on funding, which should be spent on conferences, student exchange programmes, and research projects. Members of the student government use this money to go on holiday — to take part in pseudo-trainings in resorts — while the university has a multitude of problems, such as lack of Georgian-language textbooks or student drop-outs due to inability to cover their tuition fees’, Irakli Kupradze from Green Fist and activist for SAEP told DF Watch. A statement published by SAEP online reads that 19,000 laris was allocated for the student’s government 2015 winter training project in Bakuriani, while in February 2016 the student government received 24,600 laris from the university’s budget. SAEP demanded the university authorities and the rector to be held accountable together with the student government for inadequate spending by defining an upper limit for the costs of the student government’s projects. 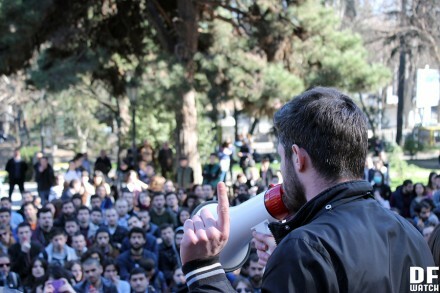 The activists also demanded reform of the student government’s bureaucratic structure and establishing control mechanism over their expenses. During the rally, president of the student government, Shalva Sabauri, gave a comment to journalists. ‘The accusations of using university funds for entertainment aren’t true, as the majority of funding requests to the university administration are for conference projects. Our government also responds to project demands from wide student society. Regarding the whole hullabaloo around this one concrete project, the sum claimed isn’t correct, as we are allocated only 328 lari for each student member and according to our internal regulations member students can’t take part in such events’, Mr Sabauri announced. ‘The worst thing is the engagement of political activists in the protest, as I believe that our students themselves are not politically engaged. I received information that representatives of the youth organisation of Nino Burjanadze’s party are present here’, Mr Sabauri added. 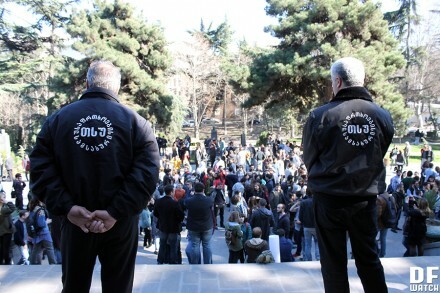 DF Watch tried several times to contact representatives of the Tbilisi State University for a comment, to no avail.